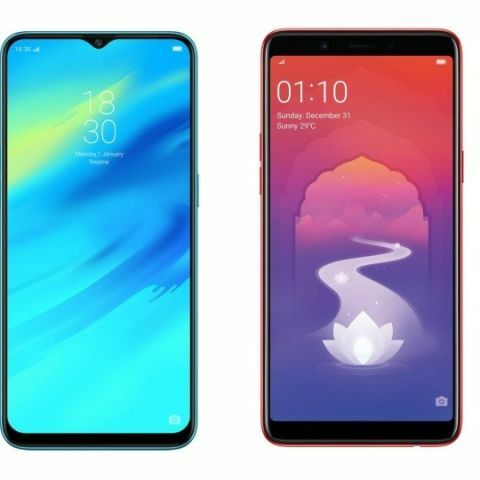 Today, we are comparing the RealMe 1 with the RealMe 2 Pro to see which device provides the best value for your money? The RealMe 2 Pro has been launched in India with an upgrade in camera, processor and more. The RealMe 2 pro also comes with a notch on top of the display. The smartphone is available in two variants in India 4GB/64GB and 6GB/64GB. On the other hand, we have the RealMe 1, which is powered by a MediaTek Helio P60 processor. So, let’s begin. Let’s begin with comparing the specifications of these two devices in detail. The RealMe 1 sports a 6.0-inch FHD+ display, which offers a resolution of 1080 x 2160 pixels. On the other hand, the RealMe 2 Pro comes with a bigger 6.3-inch display that also features a notch on the top. Coming to the processor, the RealMe 1 comes with a MediaTek Helio P60 octa-core processor, while the RealMe 2 Pro features a Qualcomm Snapdragon 660 octa-core processor. Both of these devices are available in a 6GB/128GB variant. When it comes to the cameras, if you’re looking for a dual camera setup smartphone then the RealMe 2 Pro is might be the device you can look forward to. The device comes with a 16MP + 2MP rear camera, while the RealMe 1 has a 13MP unit on the back. At the front, the RealMe 2 Pro has a 20MP unit, while the RealMe 1 comes with an 8MP sensor on the front. 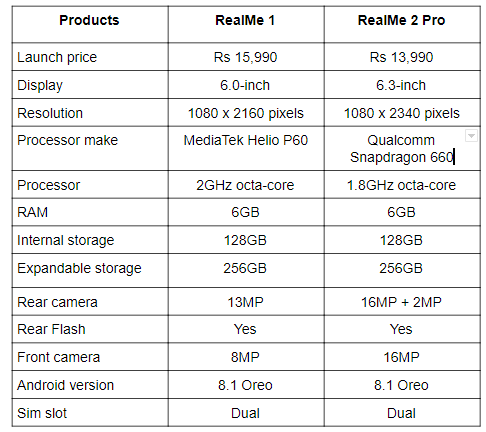 The RealMe 2 Pro is available on Flipkart at Rs 13,990, while the RealMe 1 can be bought at a price of Rs 10,490.